The 2015-16 Indiana mens’ basketball season was a season of moments. Many of the moments were good, a few of them were not-so-good, and a few of them were legendary. This book is your portal to reliving them all. The Indiana Hoosiers men’s basketball team entered the 2015-16 season with great expectations. But the season was soon in shambles after a miserable trip to Maui and a pathetic loss at Duke in early December. A remarkable comeback against Notre Dame would come soon thereafter, followed by an impressive run through the Big Ten regular season that saw the Hoosiers capture the outright title by two games. Though many people left these Hoosiers for dead in Durham, this group of Hoosiers never stopped believing, never stopped working, and finally started defending with some purpose. As a result, they started winning … often, and in impressive fashion. The Hoosiers finished the regular season on a 20-3 stretch after that ignominious Duke loss, capturing the school’s 22nd Big Ten Championship. The Hoosiers would also defeat hated rival Kentucky in an epic Round of 32 battle. Yogi Ferrell broke Indiana’s all-time assists record and joined the annals of IU legends along the way. Tom Crean, was named Big Ten Coach of the Year, a well-deserved honor given where the Hoosiers were and where they ended up. And along the way, numerous other storylines emerged — which is what made this one of the most memorable seasons of Indiana basketball in recent memory. Better Than Advertised: The Story of the 2015-16 Indiana Hoosiers is an anthology of this remarkable season, as told by the hosts of The Assembly Call IU Postgame Show. The season spanned 37 total games, each providing its own unique contribution to the tapestry of the Hoosiers’ overall body of work. 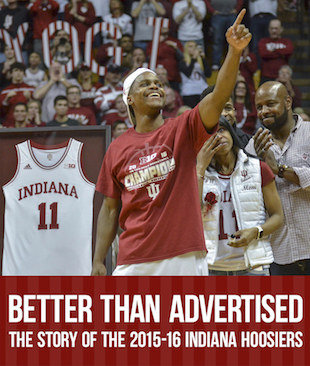 This book goes game-by-game, taking you back to the thoughts and feelings, the excitement and doubt, that smart, passionate IU fans were feeling as the season unfolded. By ordering our book, you will not only be getting a copy for yourself, you’ll also be supporting The Assembly Call (the proceeds will help us recoup the expense of getting the book printed), and help convince Amazon to keep it in stock so other IU fans are able to get their copies too. Please consider picking up your copy today!